In its Pride-exhibition ARTag Gallery presents Tero Puha´s and Julia Suikki´s submersion into the world of two B-movie stars, Linda Lust and Cheryl Love. This submersion is at the same time both a wink and a show of respect to the phenomena of popular culture. The exhibition is open from June 27th till July 3rd, 2016. Opening party on Tuesday 28th of June from 6 p.m. till 8 p.m.
ARTag presents: Art for children and for the ones young at heart. 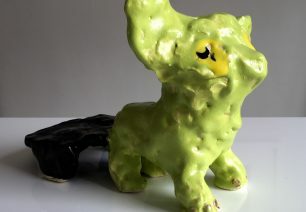 Take the kids with you and come see, touch and feel the ceramic animals by Jasmin Anoschkin, fairytale creatures by Kaisu Koivisto and happy and colourful paintings by Eeva-Leena Eklund. The exhibition´s curator, Veikko Halmetoja, will be presenting the artworks. Kindergarten groups etc. are specially welcome on Friday 17.6. from 10 a.m. to 6 p.m.
Fri 17.6. from 10 a.m. to 6 p.m. Sat 18.6. from 12 p.m. to 4 p.m.
Sun 19.6. from 12 p.m. to 4 p.m.